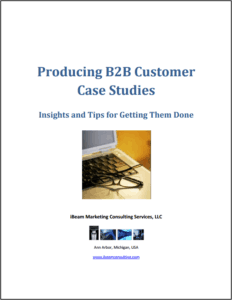 Success Stories for B2B Marketing? Meet the challenge with a little help from this whitepaper. In the world of B2B marketing and sales, very few pieces of marketing content are as compelling as a solid customer case study. A good case study (or B2B customer success story) promotes your solution without being too “salesy”, is easy for your sales team to use, and adds more fuel to your demand generation engine as a worthy stand-alone marketing deliverable and website lead-generation piece. But case studies featuring named customers aren’t always the easiest things to get started… let alone finish… since you and your marketing team aren’t in complete control of the entire process. Grab this free paper to learn more. © 2018 iBeam Marketing Consulting Services, LLC. All rights reserved.